It is a shame that our industry can be damaged by the apparent reckless use of unlicensed Prohibited Firearms at paintball facilities. Advertised on a Facebook fan page is this picture that is clearly in breach of the regulations on prohibited firearms as stated in the Firearms Act, schedule 1, section 7. 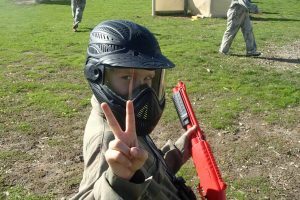 All NSW licensed paintball marker owners fall under section 13 of the Schedule which allows the use of specific paintball markers. Section 7 of this same Schedule however allows the license holder to use firearms that otherwise resemble a ‘realistic military-issued’ firearm. Licenses for Section 7 firearms are only issued to theatrical armourers and we have had the Firearms Registry confirm that no Paintball Operator or licensed paintball marker owner has this Section 7 license. It is concerning to see such a blatant breach on full display showing absolutely no regard for the laws which we are all under moral and legal obligation to obey. The irresponsible actions of this well known operator has put all responsible licensed paintball operators and players alike at risk and is clearly jeopardising the industry by allowing this image to be so prominently displayed on the largest social media networking site in the world; Facebook. It is actions like this that can and will affect the rest of the paintball community who abide by the Act. 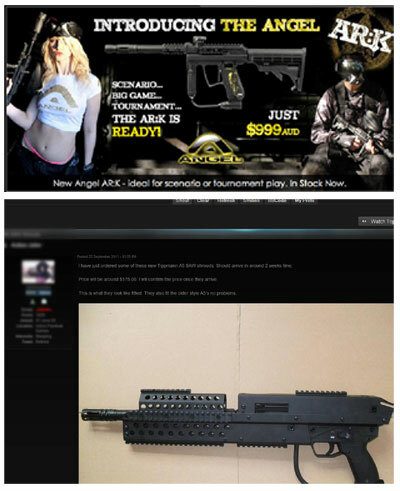 The marker displayed on this Facebook page, to an uninitated firearms user (the vast majority of the Australian population), looks more like a military-issued firearm than it does a paintball marker and begs the questions, if they were offering such markers at a paintball centre, which one would your friend or child choose? It may seem a small breach of the regulations but what happens when, for example, a petrol station is held up using one of these markers. Would the attendant know it wasn’t a real gun? Highly unlikely…. 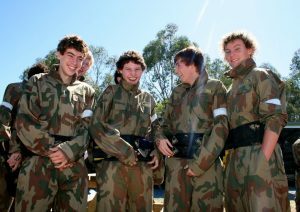 Think of the ramifications an incident like this would cause to the rest of the licensed users and most importantly the paintball industry of Australia if it was found to be an illegally modified paintball marker. To the further disbelief of the AUPBA, other apparent “reputable operators” show little regard for the Firearms Act by openly selling markers and components that assist in the modification of markers in their retail shops both online and in-store. Although selling these items is currently not a breach of the Firearms Act, such disregard for the intent of the Firearms Act almost encourages customers to modify their markers. The AUPBA has it on good authority that operators risk having their paintball permit and/or dealers licence cancelled if found to be allowing people with unauthorised markers on their ranges. Firearms Legislation exists for these reasons. It’s for the safety of the wider community, your friends and family, not just the paintball community. The AUPBA condemns such blatant disregard to the Firearms Act and hopes that Industry members are more responsible in future. The association is going on record to condemn this breach and would request that anyone found disregarding the regulations as outlined in section 7 of the Firearms Act should be reported to the authorities immediately.